Offering a wide spectrum of Ladies Ready Made Knee Length Western Garments, Ready Made Garments, Ladies Fashion Dress, Fashionable Ready Made Garments and Western Ready Made Garments at industry leading prices. These are at par with international standards. Here we are going to focus on Garment Construction which is one of the most important parts of Apparel/Fashion design so the importance of Garment Construction cannot be taken lightly and ignored while doing Fashion Design. 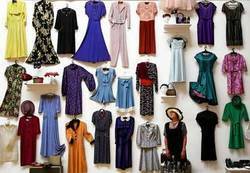 We introduce to our clients, our range of Ladies Designer Garments that are well appreciated for their unique designs, cut and style. casual, formal and smart casuals are available with us to suit every occasion. We offer our range in the most competitive prices and we also cater to the special customized requirements of our clients. Cotton Dress, Avilable in all size. We are manufacturer of best lady garments(FM-HR-098). Celestial Knits & Fabs Pvt. Ltd.